Turn up the heat with the Sorbus Fire Pit Table! A glowing fire is an instant invitation to grill, entertain, or stay warm outdoors with incredible ambiance. As a cozy addition to any outdoor setting, this square fire pit table creates a beautifully lit atmosphere. Made with a dual-purpose design for heating and grilling, it features a mesh cover, log grate, and poker tool for safety and convenience. The deep square bowl allows for long-lasting fires and an excellent heat conductor so you can enjoy a 360° view of the flames! A decorative faux stone slate panel transforms your ordinary patio set and makes the perfect centerpiece to your backyard, porch, or garden. Whether you're camping, tailgating, or hosting a BBQ, this fire pit is easy and fun to use. Relax, grill, or enjoy a cool evening by the crackling fire with family and friends. The mesh cover protects your guests from stray sparks but easily lifts with the poker tool to adjust logs and keep your fire going. 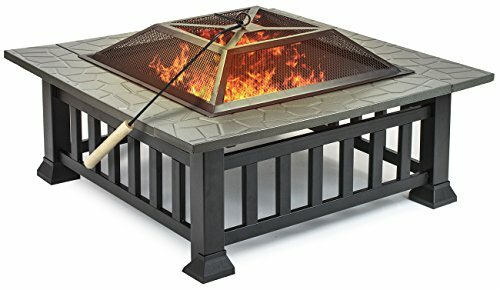 Use the log grate to entertain with roasted marshmallows, kebabs, hot dogs, and other nostalgic comfort foods. Take it with you during RV trips, camping, tailgating, beach days, bonfires, parties, BBQ's, and more for seasons of entertainment. When not in use, simply dissemble the fire pit and pack away until the next occasion. The sturdy design is complete with a sleek square frame for style and convenience. Made of steel. High tempered painted in gray/black. Easy to clean, simply lift the bowl out and tip ashes into trash. Easy to assemble with instructions included. Measures Approximately 32" L x 32" W x 16" H.
Perfect for any deck or patio, this fire pit creates a warm atmosphere to enjoy all season long.